SUMMARY: Fifteen-year old Paige Turner has just moved with her writer parents to New York City. As an introverted artist, Paige worries that she won't fit in. In an effort to discover who she is, Paige keeps a journal of her own drawings and advice to herself. REVIEW: How gorgeous is this book? The surreal illustrations really make Paige's already-interesting story pop. Through her artwork, we get to see a side of Paige that her friends and parents do not see. Paige's art shows us that she is insecure, scared, brave, happy, sad, moody, shy, proud, and confused all in the midst of just a few pages or days. This is the realistic life of a modern teen, and I think many young girls will relate to Paige. Though she is moody and unfair to her mother at times, Paige remains a likable protagonist because she is so realistic. 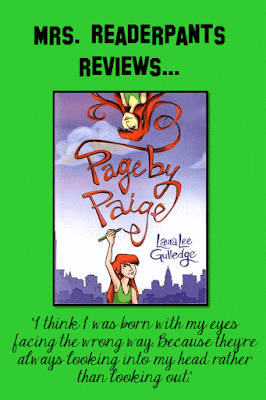 I think even adult readers will see some of their own teenage years reflected in Paige. Supporting characters--Paige's new friends and her parents--are also likable and realistic. I love how each of her new friends has his or her own distinct personality and interests. I also love how Paige's friend Jules is gay, but that does not define her at all. It's part of who she is, but no one acts like she is any different from anyone else. She seems like she'd be a pretty cool girl to hang out with. There's a light romance. It's cute and sweet and completely PG. THE BOTTOM LINE: An excellent addition to middle and high school libraries. Recommended especially for girls who love art or looking for a realistic story with a little romance. I know exactly who I'm recommending this book to tomorrow at school! STATUS IN MY LIBRARY: We have it, and I will be recommending it.